When considering nice wooden driftwood sets for the home, which can help bring, warmth and cosiness, consider the Legend Vantage Deluxe Driftwood Set. This set provides the look that you need to give your home a sense of purpose and style. The Fireplace Warehouse sells items that are of high quality as well as provide a large selection of fire sets, so they are in the business to help you make your home that much cosier place to enjoy. 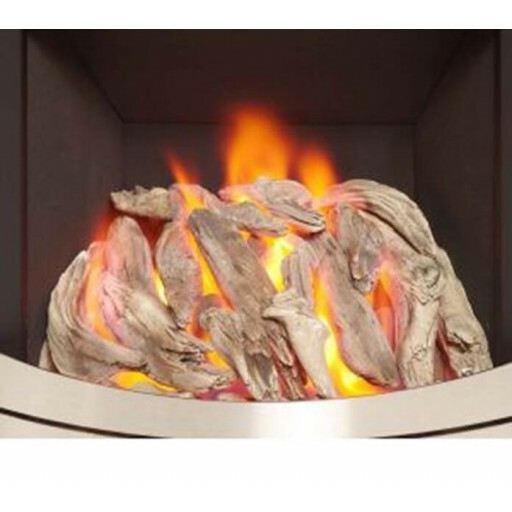 Deluxe Driftwood Set for the Legend Vantage gas fire is a fully deluxe item. You can be sure to enjoy a matrix, side pebble strip, front pebble strip, rear pebble strip as well as the pebbles to get your gas fire going. Our gas fires provide a focal point for holiday gatherings and other events you may host during the chillier months of the year. Rest easy knowing that the Deluxe Driftwood Set for the Legend Vantage gas fire will provide great warmth frosty winter days. This item also adds quite a lot of character to your living space. The eminent beauty of gas fires will be quite apparent with the Deluxe Driftwood Set for the Legend Vantage gas fire. It provides a similar cosy feeling that a traditional fire would have. And the best news is that far easier to maintain and use. Many gas fires may contain a real flame, which helps to add to its enduring charm.